SiteGround hosting review: Best hosting provider for starters and small business owners. Siteground hosting is one of the top web hosting providers in the world. It has its one brand name which is built on thousands of customers trust. Most of the blog and forums and website always recommend the Siteground hosting, and some even have given a five-star rating for SiteGround. Now since our goal is to find is it worthy for your blogs on 2018-2019, let’s find out the Siteground hosting review 2019. To know more about it and to take a clear snap of its features and other advantages of this hosting. Before knowing about the advantages let’s find out what is the company really up to and about the company standards. Siteground was founded by a group of university friends and who are IT enthusiast in 2004. In the beginning stage of SiteGround the friends worked from their rooms and later they turned the company and increased its presence drastically, and now the company is having 320+ employees and it also has the four data centers across the United States, Europe and even in Asia. Siteground hosting is an impressive company which has crossed much authority and big branded companies and become one of the youngest and best hosting providers today. Siteground hosting has acquired 450,000 customers, and it’s currently having thousands of trusted members. Siteground hosting has some best features and it has been an excellent web hosting provider for starters and small business owners. Thousands of domains have trusted this hosting provider and it has been outstanding in terms of uptime and speed. Siteground offers shared hosting, cloud hosting, dedicated hosting, and reseller hosting. And shared hosting plan and dedicated hosting plans are very popular and used by thousands of domains. In shared hosting, it is having three plans those are startup plan which is particularly crafted for a great web presence for a starter. Grow big plan which crafted for increasing web presence. And its last plan is Go geek which is especially for real web geeks. Siteground hosting offers free “.com” domain for every web hosting plan for 1year. And this is the best deal for starters. Siteground hosting offers free site transfers so that newbies can leave it to hosting providers without making their website clumsy. Its uptime is the best uptime in the industry and you can know more about that in below section. It offers 99.9% Uptime which is guaranteed by SiteGround. It minimum start plan offers 10 GB Web Space. This startup plan for shared hosting is suitable for 10000 visitors or below if you have more visitors than 10000 a month then simply move to another level of hosting which makes you even better. It takes care of your site by taking the free daily backups. It’s integrated with the cloud flare CDN to make you faster than others and that too it CDN integration is easy and free. Siteground web hosting offers the unlimited MySQL Database. All the apps are free to install. It offers free SSLs and Http/2 certifications. Along with that, it’s having the customized Cpanel where you can customize and control your hosting account easily. It offers 30-days Money Back guaranteed. So it’s worth a try. These are the key features of the SiteGround hosting, let’s know more about the SiteGround hosting by its pro and cons. 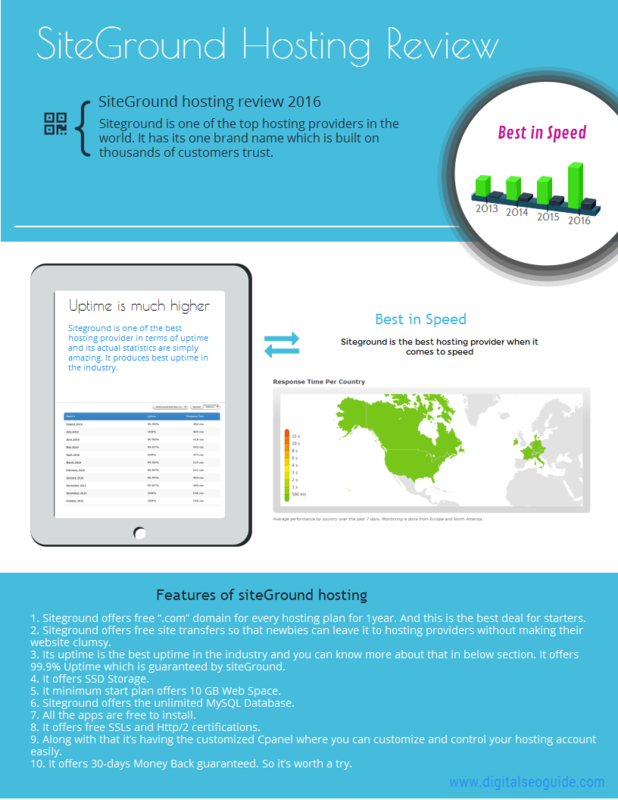 Siteground hosting is one of the best web hosting providers in terms of uptime and its actual statistics are simply amazing. It produces the best uptime in the industry. Although many companies say the same uptime you can see the average uptime statistics when you really observe it. 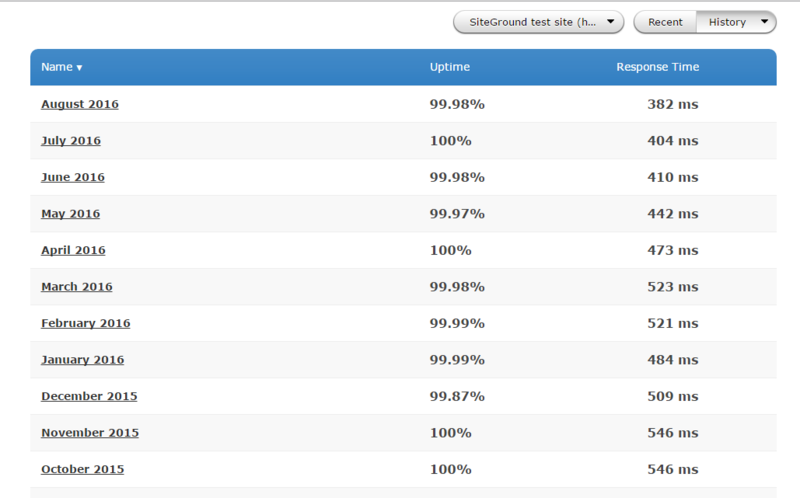 As promised the SiteGround uptime is over 99.90% and most of the time it reaches 100% as well. August 2016 Average uptime: 99.98%. This Screenshot proves the uptime level of the SiteGround and its response time. If you want to see last 24 hours report and past 7days report then you can check them in below screen shot. So, the uptime of the SiteGround hosting is the plus point for the SiteGround reputation. The SiteGround customer support is one of the easiest and friendly customer support in the present web hosting world. Customer service is the one area that a lot of customers see before purchasing an item. So, it’s a vital part of any company. Siteground particularly pays a special attention to the customer service. And they have processed over 1500+ tickets, 800+ phone calls, and 2,000 chat request each day according to hosting facts. The customer care of the SiteGround hosting is user-friendly and very responsive. They respond pretty fast to solve your problems. Siteground is the best hosting provider when it comes to speed. It faster than the other web hosts and over past few months, it almost crossed all the other competitive web hosts in speed according to the Pingdom test. It’s loading time is 386ms and it’s almost 45% faster than the other web hosts average load time that is 851ms. Siteground is also very consistent in speed. So it’s one of the pros of the SiteGround hosting. This the report of the response time per country, and this is the last 7 days average report. Site ground offers the best security options for their WordPress managed hosting. And they also provide extra security for all types of sites which are hosted by SiteGround. Available tools include Spam Assassin and Spam Experts, IP address blocklists, Leech Protect, and hotlink protection. Along with this, it’s also having to hack checking activities where SiteGround checks your site daily and let you know the result. But it’s going to cost a $1 or so. Siteground hosting also offers easy e-commerce install for all the e-stores customers. The Main cons of the SiteGround web hosting are it offers only free setup for its monthly paying customers but not the one-time paying customers. Everyone thinks to buy monthly payments but it’s a kind of bad experience because they just give the eye-catching monthly price to attract you at the start but when you sign up and continue your journey with them then after they will increase anonymously. If you are clever enough to recharge your host and to purchase new connection from them then it’s a fair deal for you. The main con of this deal is they only give one-time setup free if it’s over then they will charge extra for you. And the rate which is added to your bill won’t be added until last minute of your payment so it’s annoying. It may not be a big deal for many of them but particularly people who care about an at least single dollar, it’s helpful for them. Compared with other web hosting sites, SiteGround’s storage space is little less in size so you might hate this kind of space. If you want to clarify disk space if you think it’ll be a concern then check your hosting details. They will, however, offer a helpful note as to how many monthly visitors you can safely handle without experiencing any issues. However, if you’re just starting out, the “Start-Up” plan then it’s usually enough for the startups and beginners. If you want more from the web host then you can increase your plan. InMotion Hosting is SiteGround’s big competitor. They both have incredible features, support, and pricing plans. Be that as it may, InMotion’s hosting pricing plans are better, generally speaking, InMotion hosting offering a 90-day guarantee and clean WordPress installation. On the other side, SiteGround has highlights like free SSLs and worldwide server centers. SiteGround is a strong decision too, particularly in the event that you esteem their better and advanced features. Bluehost is one of the most popular and International’s web hosting providers. They beat SiteGround on hosting plans. Nonetheless, SiteGround offer better and improved hosting features while Bluehost has better “rewards” and upgrades. In the event that selection matters more to you – then pay somewhat additional for SiteGround. In case you’re quite recently running basic projects, at that point Bluehost is great. Also, Read Bluehost hosting review. If you are also looking for best domain registrar Namecheap Vs Godaddy, be sure to check out Namecheap and Godaddy. In the event that you are searching for a best hosting company with a worldwide bent, an emphasis on strong hosting features then try SiteGround Hosting for sure. If you are searching any other hosting company having same features then try InMotion hosting. Also, check out InMotion hosting review. This is all about the Siteground web hosting review 2019, I hope now you are clear about the SiteGround web hosting pros and cons. Now, decide yourself and opt for the best web hosting. If you are having any sort of queries then just comment us below, we’d love to hear comments from you.